Peated whisky gets its smoky flavour from compounds which are released by the peat fires used to dry malted barley. The Length and intensity of exposure to the peat smoke dictates the strength of this flavour as do the characteristics of the peat itself. But how did this style of whisky come into being and why has it now so popular? Let us begin with the peat. For a long time this was the most readily accessible fuel in many areas of Scotland. The accumulation of water in boggy areas slows down the decomposition of plant material such as moss, grass and tree roots which leads to the creation of peat. Peat accumulates extremely slowly and bogs are often thousands of years old leading to peat being broadly classified as a fossil fuel. Peat was the primary domestic fuel in Scotland for a long time due to it’s ready availability in many parts of the country. And it fired not only hearths but distillery kilns as well. Today, distilleries largely rely on commercially malted barley. In days gone by, however, they necessarily had to malt their own. Malting makes the starches within barleycorns soluble so that the sugars may be converted into alcohol. In other words, malting tricks barleycorns into thinking spring has come. Barleycorns are steeped in water and allowed to germinate before the process is halted in the kiln. When peat is burned to heat the kiln, it also produces an especially aromatic smoke. 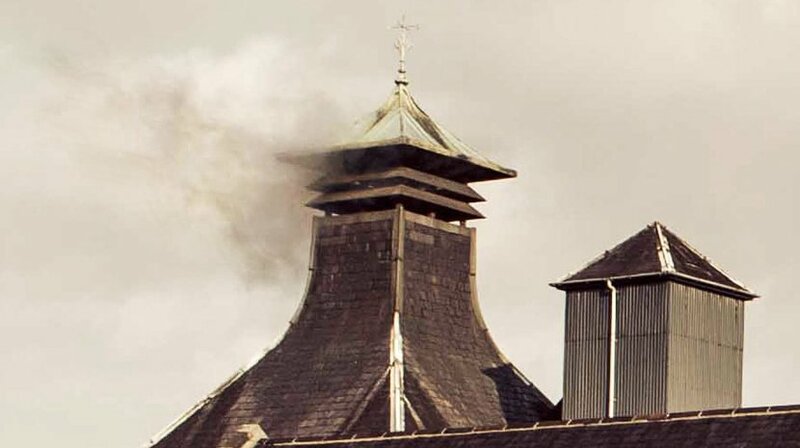 To a point, this smoke has a considerable influence on malt during kilning, imbuing it with compounds called ‘phenols’. Typical flavours include tar, ash, iodine and smoke. The qualities of peated whisky divide consumer opinion. This has always been the case. And yet due to a lack of alternative fuel sources, whiskies using entirely peated barley were once the mainstay of the industry. This was especially true of the remote Highland and island distillers. That was, until the introduction of coal and, by continuation, coke. The Lowlands and Speyside were the first to convert. The development of rail transport in Scotland led to the wide availability of coke. Coke burns more evenly, more consistently and with less smoke than peat, and so these regions were the first to realise the potential of un-peated whisky. Which regions stuck with peat? Others followed, but not all of them. Initially out of necessity, Islay to the west, Orkney to the north and several mainland distilleries held on to tradition. These distillers continued to use varying proportions of peat during the kilning process. This maintains a traditional and now largely unique style of whisky with lots of variation and flavour. And those which still have their own maltings such as Laphroaig on Islay, Highland Park in Orkney and even Balvenie in Speyside go one step further by peating relatively small quantities of barley for their own use. Perhaps it is fair to say, then, that peat is so much more than a stylistic trait or a differentiating factor which tempts whisky drinkers to test their mettle. It is much more than a simple addition of ‘smoky’ flavours which overwhelm all the many others. Peat was and still is a defining aspect of Scotch whisky, and we should approach it with reverence and an open mind from the start of our explorations. How do we measure peatiness? Peated whiskies are generally compared using a measure of phenol parts per million (PPM). This refers to the quantity of phenols in the malt itself rather than the contents of the finished whisky. Some lighter whiskies might measure up to 20ppm. Bruichladdich have been very active at the other end of the scale with their Octomore whiskies ranging from 167ppm to over 300ppm in one case. The rating is a blunt tool though and whiskies of similar ppm can still taste very different. Is peating exclusive to Scotch? Actually no. India, Japan and New Zealand all boast peated whiskies of their own so the peat party is certainly not just for the Scots. There are many peated whiskies on offer out there and most bartenders or shops will be able to recommend drams that range across the PPM scale. These five peated whiskies give a great sense of what’s on offer.